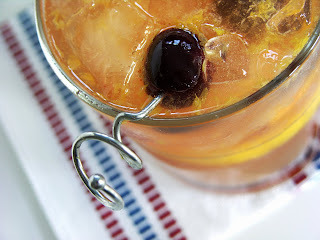 This month’s Mixology Monday is hosted by Tristan over at The Wild Drink Blog. The theme: Superior twists. That is, he wanted us to alter, or put a twist, on a classic cocktail in such a way that it improved upon the original version. My favorite cocktail of all time is — without a second thought — the Old Fashioned. So the decision to put a twist on this drink was made with gravity—you just don’t f*&# with this beverage. I was ready to abandon the endeavor at the first sign of trouble. I even had a back-up plan ready for when it didn’t work out—I had no expectations. Substituting vanilla cognac for bourbon, I was worried the drink would end up tasting too sweet, and that the consistency would be syrupy and unpleasant. But the resulting drink was light and even somewhat refreshing. And though I won’t go so far as to say it’s better than the original, it certainly gets the job done. I present to you the Old Fashioned, with a twist. Leaving out the sugar cube and adding orange bitters, rather than Angostura, helps to balance out this drink. 1. Muddle first four ingredients in a double rocks glass. 2. Fill glass with ice. 3. 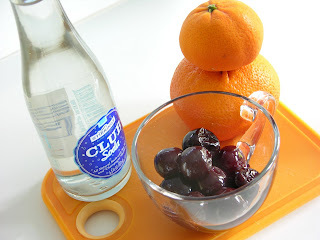 Top with club soda (or seltzer), stir and serve. Garnish with a cherry and/or orange slice. I didn’t have the forethought to infuse my own vanilla cognac, which I will definitely do next time, or to brandy my own cherries ahead of time. So of course, I had to improvise and whipped up a small batch of “brandied” cherries on the fly. Put all ingredients in a small saucepan and turn on low heat until the cherries have thawed and the sugar has dissolved. Let rest for 15 minutes. To find out more about Mixology Monday, and to check out next month’s theme, go to http://mixologymonday.com/. Remember to check in at The Wild Drink Blog for the MXMO roundup later this week.